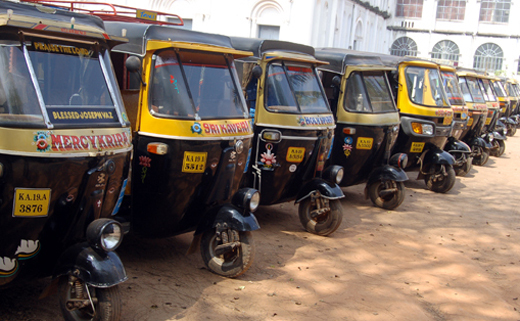 Mangaluru, Aug 27, 2015: According to reports, the city has at least 5,685 auto rickshaws running legally within the Mangalore City Corporation limits. There are 94 notified auto rickshaw stands that can hold only about 1,000 rickshaws. The number of auto rickshaws is on the rise. space to hold the rickshaws is a big shortage. This has resulted in illegal stands cretaed by different unions. Thee stands even at small junctions and side roads is a great hindrance to traffic. Often it is seen rickshaws are parked in two rows, which causes traffic jams and accidents. The rickshaw drivers and owners’ associations have been demanding for several years designated areas for parking of rickshaws. Finally, MCC has decided to give the green signal to 112 auto stands. The district administration had notified 69 designated areas for parking of rickshaws in the MCC limits even two decades ago. After 1992, the authorities did not take any measures to notify such areas, said rickshaw drivers’ association office-bearers. The identified designated areas will be notified after the Council of the MCC approves of the list. The road safety committee meeting had witnessed the rickshaw drivers raise the issue several times and even submit a memorandum to notify 317 rickshaw stands within the MCC limits. In 2009, although the Corporation decided to notify about 72 stands, the work could not be taken up as the widening and concretising of the roads too commenced then. Meet : Chairmen of the standing committee for town planning, who spoke to media said that the decision on notifying 112 auto stands identified by the Police Department will be ratified in the next council meeting that is scheduled for August 29. The MCC had decided to develop major circles (junctions) - including PVS Circle, Bunts’ Hostel Circle, Mallikatte Circle and Kavoor Circle - in the City limits. While preparing the action plan for the development of these junctions, we have made provisions for bus bay and auto stands. Accordingly, the auto stands will be developed. With 112 auto stands, about 1,500 rickshaws can be parked.